Above: Ashley Dang's images of Ann Nguyen from their recent professional play date. I used to live in Long Beach, but now I'm located in Orange County. I love the community in LBC so I make excuses to go to Long Beach quite often, especially to go on bike rides and play dates with my two photographer friends, Lisa Beth Anderson and Ashley Dang with whom I'm a fellow photographer. 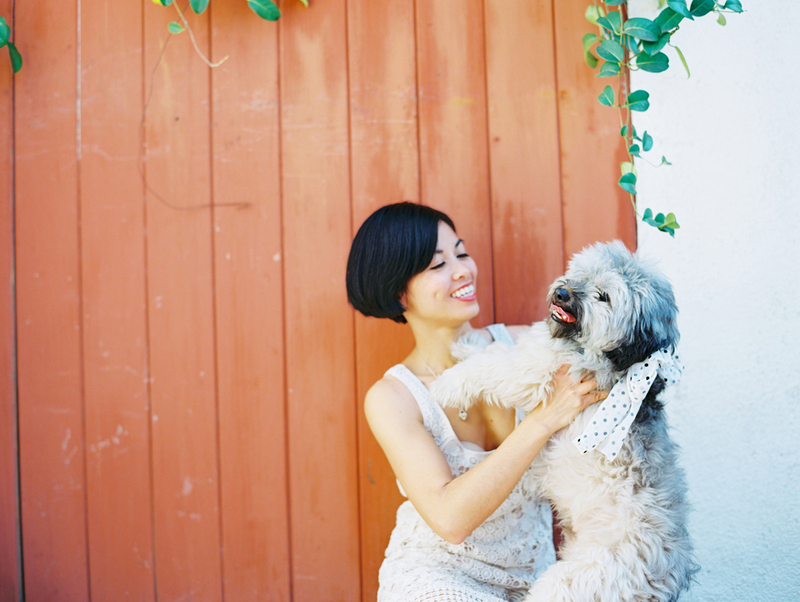 The series of photographs of me and my dog by Ashley from one of our recent forays. As photographers, we are lucky to have very flexible schedules, so when we're not doing client work, we practice our craft and test out our gear, which inevitably turn into very fun and creative projects. Our intent was to play around with our vintage film cameras, explore the neighborhood for good shooting locations (i.e. location scouting), share our knowledge and passion for photography with each other, and break the blue Monday stereotype! Using our bikes to get around just made sense to us because we can get a feel for the light and complete scenery. It's a wonderful way to get around quickly but also being able to feel the moment, which is so important to us as photographers. The green bike I was riding is a 1540's -speed women's Huffy bike. 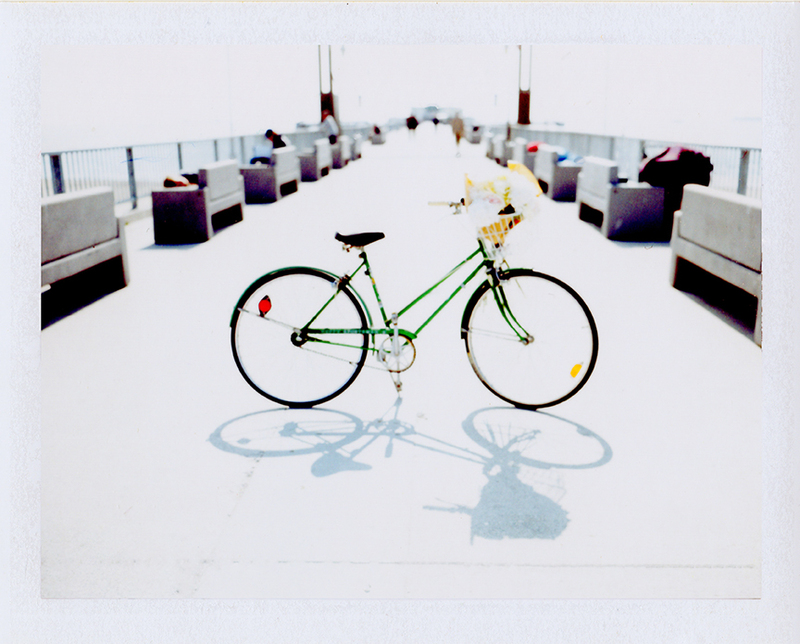 It's a perfect cruising bike and oh so photogenic. Added bonus to biking: the dog gets a jog! Yes, that dog in the picture is real and not a stuff animal. He loves biking too! His name is JJ and he's a shitzu/terrier mix. Even though he is pictured sitting in the bike basket, he actually prefers to run alongside me as I ride. A leisurely biking pace is a good match to a dog's natural stride so it's great exercise for them. 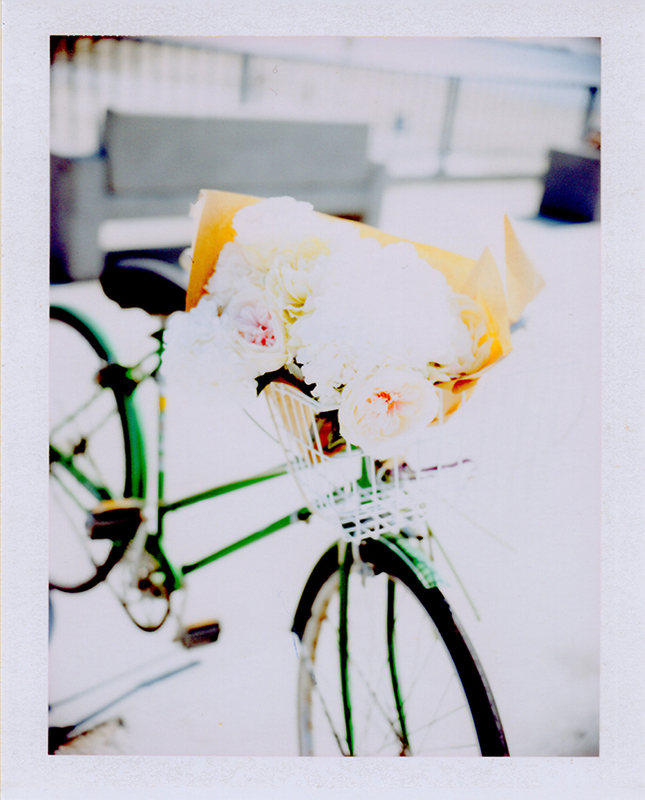 Above: Two of Ann's own polaroid images of her bike from that day. Before taking your dog onto the streets though, I highly recommend practicing with them on less crowded roads. I approach it like teaching them a new trick. They won't get it right away but if you're patient and consistent, they will catch on quickly. When you ride straight, your four legged companion can keep up easily, but if you need to stop often or turn often, it can throw them off and you might get the leash tangled in your bike. It takes a little bit of practice but the more often you bike and run together, the more attuned they become to your movements, which makes for a smoother, side-by-side ride. It took us about 3-4 bike rides for JJ to get it but once he did, it was smooth sailing. I absolutely love seeing the joy on JJ's fuzzy face as he runs besides me. I can tell he's just in pure doggy bliss! We had such a productive and fun biking & photographing date that Lisa and I are planning to do it again very soon. My friend, Jon, owner of Plenty of Bikes in Signal Hill offered to lend us his vintage bikes for our test shoots! I'm really looking forward to it and can't wait to do more! Ann is an incurable romantic with a passion for analog photography. She loves finding beauty in the unexpected and believes the most simple gesture is the most meaningful. She believes in art and its power to connect us on the deepest level. Ann was born in Vietnam and came to California when she was eleven. She loves hiking, and backpacking and will drag a gazillion pounds of photography equipment up a mountain to capture it. She has an M.A. degree in English and reading is my favorite past time. I quote E.E. Cummings a lot. She loves metaphors, symbolism, paradoxes, and anything that has multiple levels of meaning. “Lost and Found” is one of these. Find out more about her at www.lostfoundphotography.com. She just became the Communications & Marketing Manager for The Ecology Center in San Juan Capistrano.